Andy: This is one of my absolute favorite rums. It is extremely smooth with a hint of sweetness. The aroma is of oak and some fruitiness. I like to drink it with a splash of diet cola and a little lime, but this is so smooth, it is delicious even straight or on the rocks. At around $30 for a 750ml bottle, it is a little pricey, but worth every penny. Oh what I wouldn’t do for one right now. Adrian: This rum has a smooth, deep, rich flavor, and goes down very smooth when consumed straight or on the rocks, with no strong molasses flavor or a strong sweet flavor. It is almost like drinking a sipping whiskey. After trying it with Coke, I really could drink this off the floor. It has a really smooth, top shelf taste and puts the normal Mount Gay to shame. This ranks right at the top behind Pyrat Cask in flavor. Just ordered this one..thanks for the review! Based on your review, I have bought a bottle of Mount Gay Extra Old. It is a delicious rum, with a lot of character and complexity to the taste. It’s great for drinking “neat” like fine single malt Scotch. I would have a hard time adulterating it by using it in a mixed drink. Use Bacardi for that! I like Pyrat but this is my new favorite. I cracked a bottle at a dinner party and could not get enough. Delicious smell and taste. Great with coke. Mt. Gay is a distillery that has been continuously producing rum from the Caribbean longer than anybody. It’s a treat to visit the distillery in Barbadoes and you find out the real versus the fake. My. Gay employees their own Cooper who builds oak casks on site and in view of the tours. He chats them to the degree needed depending upon what style of rum is desired. The barrel house at Mt. Gay is huge but not as huge in terms of major distillers. Much of the rum is lost to the Angels and a few fat spiders residing in the barrel house. I toured back in 1996, and I’m sure they have expanded operations and have acquired more used barrels from across the sea. It gives them the ability to produce many different types of rum. It more like a family run distillery where the people take a lot of pride in the spirits they produce. They even got a guy to give up his Malibu shirt, which they threw in the fire and gave him their best T-shirt from the gift shop. 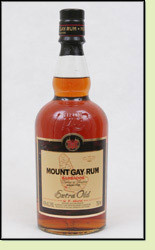 Mount Gay is real rum and made by expert craftsman over the decades. I enjoy almost all of their products and have enjoyed seeing the garner more space on shelves in liquor stores. Not a great fan of their newer bottle styles or labels but everybody can’t get down to Barbados to see how island rum is done. If there is a bit of e tea price it’s because all of the action happens in Barbados and then is taken by ship to the various ports and handed off to distributors. Having said all that, it still isn’t my favorite rum but is sure is unique authentic island rum.